BBC Radio Kent has won two gold awards at a ceremony in Birmingham to mark excellence in BBC local radio. Good Morning Kent won the Gillard award for best breakfast programme, and the Drive Show's D-Day anniversary show was named Best Outside Broadcast. The judges described Good Morning Kent as "a smooth programme" interested in news, with "real strength and depth". Drive was praised for its "quality and well-informed presentation and the choice of contributors". The programme was also recognised for its "skilled editorial and technical production". Speaking at the awards ceremony on Thursday night, the presenter of Good Morning Kent, John Warnett, said the award came as a great surprise and he praised the people who rang into the programme's phone-in. "I would just like to thank my listeners because they make such an important part of the programme." Drive presenter Dominic King said the experience of making the D-Day anniversary show with the veterans had been "inspirational and amazing". He said: "John and I were absolutely astounded to get two golds for Radio Kent. "It's the team behind the scenes and in front with us who make that come together and we are very much voices on a stick." 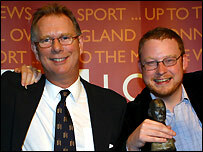 Paul Leaper, the managing editor of BBC Radio Kent, described the double victory as a terrific achievement. "It's a tribute to the whole station as both entries benefited from real team effort to bring it all together," he said.